After writing about the state of our investment portfolio recently and mulling over how to possibly improve it, here’s where I talk about what we’ve actually decided to do. After getting a good look at our set up, I took into account some valuable information, comments, tips and the use of helpful tools garnered from a few sources. #1 Free information, resources and tools from online stock brokers such as Scottrade, Etrade and TradeKing. #2 Periodicals, financial articles such as those from the Wall Street Journal and Investors’ Business Daily. #3 Internet financial sites such as CNN Money, TheStreet.com, Morningstar, and the like. #4 Resources such as this list of investment tools and software, many of which are free. #7 Discussions and conversations with financially savvy friends and relatives. Our main investment strategy is to follow a simple asset allocation plan based on the “random walk theory”. I have been asked often about why our portfolio seems quite “basic” and “simple”. And my response is this: I don’t believe investments need to be complex in order to make decent returns that we could be happy with. I am not aiming to beat the market (but if I did, that would be just swell!). I also found that after almost two decades of investing, that the simpler our approach was to investing, the better our returns turned out to be. After some tinkering, we came up with this new allocation that we’re going to be executing at some point. As it involves putting new money into the market, we’ll either DCA the funds in or wait for a buying opportunity of some sort to happen. The gray rows are those positions that we’ve decided to change. 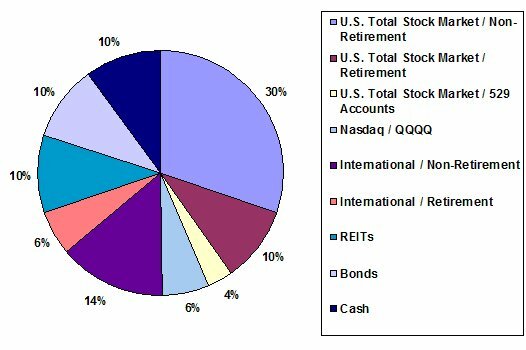 This gives us a US position of 50%, an International Equity position of 20% (which is actually 28% of our total equity exposure) and a nice whole number breakdown for the rest of the asset classes represented. Our “safer” investments still add up to 20% (bonds + cash) of our investable assets. All in all we’ll get: 70% stocks, 10% REITs, 10% bonds and 10% cash. Now not to be a wet blanket or anything but to aid us in executing our plan and to allow us to buy into more favorable prices, here’s hoping for some kind of reasonably sized market hiccup to transpire sometime in the near future! Still, I have about 5% in timber REITS, but these are long term holdings, now new money. Just food for thought. Nice breakdown. I plan to use some form of this myself, but first let me throw a monkey wrench in and see what you think. How would you calculate the % that a real estate investment takes up in your portfolio if it wasn’t a straight up purchase, like a stock or bond (usually) is. Any insight on FLIP’s? Looks like a solid strategy but I would like some feedback. Nice strategy, no real estate investments? Well, you have a point! I do need to get real estate investments in there too. Was thinking of buying property in Florida or Texas. Low cost of living areas that I may want to move to someday. Plus the weather is almost as good as what we have in California. I just have to convince my husband that it’s a good idea! I live in Florida, and i can tell you, there is no better time than now to invest in real estate in Florida, there are great bargains in foreclosures and short sales. I’m surprised there’s no mention of gold on here. Seems like everyone is recommending that these days. Is gold a rip-off?